Movie film banner design template. 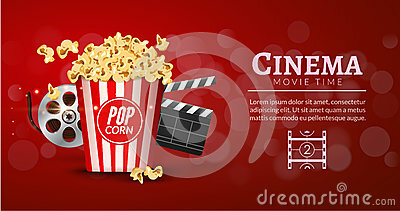 Cinema concept with popcorn, filmstrip and film clapper. Theater cinematography poster. Realistic Cinema Background. Movie Premiere Poster. Cinema poster design template. Movie film reel and strip, popcorn, clapper board, soda takeaway, 3d glasses.